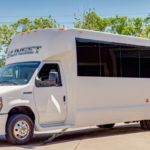 We Have The Largest and Best Party Bus Fleet in Denver! 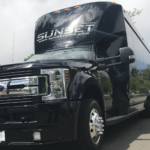 If you want the very best in party buses, look no further than Sunset! we carry only 2018 and 2019 model buses, ranging from 12 all the way up to 50 passengers. If you have some extra time, we invite you to come and see us and experience “The Sunset Difference” for yourself. 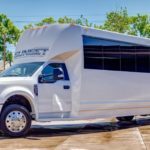 Rent a party bus from Sunset Limos and make your party a mobile bash. Call (303) 426-9668 or click here to reserve a party bus today. Our newest party bus has old-fashioned comfort and cutting-edge technology. Available in Black or White. 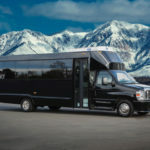 Our newest mobile party HQ, a hig-tech party bus in black or white. BRAND NEW FOR 2017! Our new Mercedes sprinter is ready and waiting to take your party or event to the next level!